Чемпіонат міста 2016 Команда 2006 р.н. Rhythmic Gymnastics isn’t just any kind of sport. It’s a combination of harmonizing each other’s art and sport. Rhythmic gymnastics isn’t limited by force, endurance and dexterity. The gymnasts have the difficult task: They need to feel the rhythm and pick up the expressive movements. In other words: Gymnasts must nurture an aesthetic spirituality. Through the relationship of gymnastics and ballet, the co-ordination and expressiveness of each movement (including plastic, sense of rhythm, grace, and even artisticity) is developed. The foundation of any dance is classical choreography, which provides basic and fundamental lessons (stretching, flexibility, power loads). This choreography is relevant and just as in everyday life-good posture, smooth walk . Becoming more sustainable and better oriented in space, improving the skills of your own insurance will help acrobatics, which is an integral part of any kind of dance, sport. As already written, rhythmic gymnastics presupposes the presence of subjects: (Rope, hoop, ribbon, ball) but sometimes the gymnasts act without them. But in world-class competitions, there’s the need for subjects. Contest winners are defined in separate exercises and in group exercises. The sport girls used to perform under the piano or some other instrument. Now orchestral phonograms are used. The choice of music is the personal matter for the gymnast and trainer. No more than 1.5 minutes per exercise. The gymnastic carpet in which the exercises are performed is 13 x 13 meters. Rhythmic gymnastics is a rather young sport. It came from the master’s of ballet of the Great Mariinsky Theater. 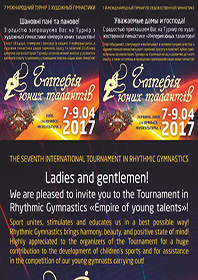 Rhythmic gymnastics quickly won the world recognition and became very popular sport. This kind of sport is an extraordinary combination of the harmony of the soul and the body.